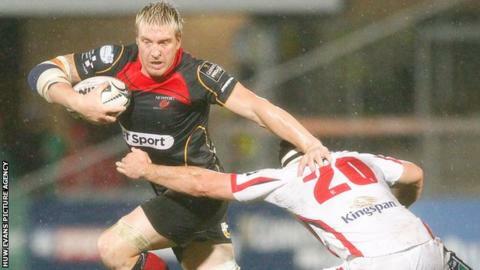 Former Wales back-rower Andy Powell has criticised his former side Newport Gwent Dragons' team management. He will play for Merthyr RFC in Welsh rugby's Championship next season as they bid for promotion to the Welsh Premiership. Powell, 33, says players became stale at Rodney Parade as they were left on the sidelines. "They weren't picking the players which should have been picked," said the 2009 British and Irish Lion. Under director of rugby Lyn Jones, Dragons rose above Cardiff Blues in the Welsh regional pecking order in 2014-15, finishing ninth in the Pro12. They also reached the European Challenge Cup semi-final. Powell's own appearances were limited and he feels being outspoken about selection policy counted against him. "I didn't play too much. Everybody knows me - I speak my mind," he said. "Sometimes I do need to probably shut it, I've been around the block and they weren't picking the players which should have been picked. Ex-Wales back-rower Andy Powell acknowledges he may be a marked man in the Championship as Merthyr RFC's star signing. "And we had a good enough squad to play two teams and when some boys are not getting picked, they get stale. "And when they're sending them out to a different club and everything's disjointed - you just need to keep everybody fresh and playing. "You look at Saracens for example - they've got a good enough squad, the Dragons had a good enough squad. "But it's not about them. They're gone - it's about Merthyr now. "And I've committed myself fully to Merthyr." He added: "You need to have a bit of fun in the game. The last few years, I haven't really enjoyed it. "The Dragons last year, it was good at the time, but I didn't really enjoy it. "It was a different environment. I think the fun needs to get back into the game a bit as well." Powell has been pleasantly surprised at the Ironmen's playing and training facilities. He is also impressed by fitness standards at a club which believes it is on the brink of achieving the Welsh Rugby Union's A licence standards that would allow it to be promoted to the Premiership. Welsh rugby's second tier is being expanded from 12 to 16 teams at the end of the 2015-16 season. The top four teams from the Championship who hold a licence will be promoted. Powell says his move to Merthyr after talks with their backer Sir Stan Thomas does not mean his top-flight days are over in the long term. "I haven't said it's over. I met with Sir Stan and he told me what he wanted. "It's a challenge and I'm going to meet that challenge head on and address it. "You're never too old - look at Nick Easter. He'll be 37 in the new season and still doing it. " "I know I'm still good enough to do it, but it's a challenge I liked at the time and it just seemed right." Powell says he is looking forward to playing a lower level in which he gained early experience with Llandovery. "Merthyr have a cracking pitch and a training ground behind and some of the boys have the same fitness standard as professional guys. "You can see why some people in Wales should be doing better... but they're just not being picked up [for the top flight]." The BBC has offered the Dragons the chance to comment.